Chhole Bhature from Bhogal Chat Corner, Connaught Place. Cost Rs. 60 odd. Bhature : one of its kind - soft and squishy from inside, perfect to soak in some of the gravy of 'Chhole'. 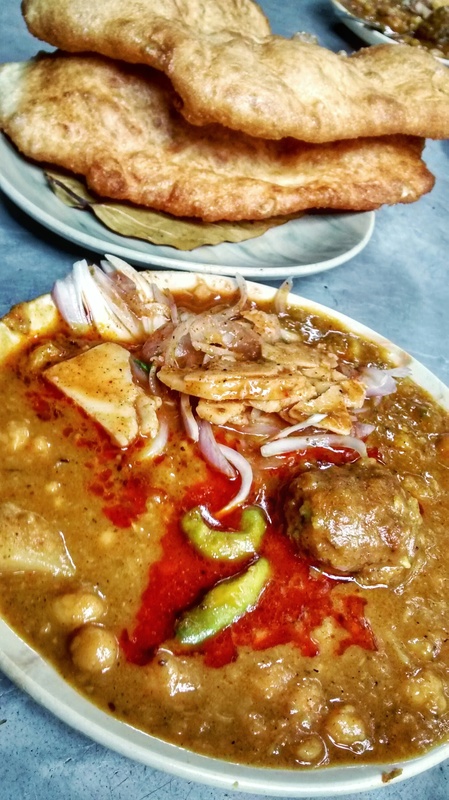 Chhole : They are called chhole just for the sake of convenience - otherwise it is a curry or spicy stew of various things - Chickpeas (chhole), Potato, Kofta (Dumpling), also saw in some gobhi in there. In the huge pot that they are cooked there is Paneer as well, however that is not served with Bhature, but with Rice. Its the only place where they serve 'Kachalu' with Chhole Bhature, kind of pickle served with various chats in Old Delhi (given the fact that Delhi 6 is barely 1000m as the crow flies, tells a lot about the influence). d k nigan Which area? Sanjayy Kumar It is difficult to believe that these chole with a kofta, so different in appearance from classic chole sold with bhature all over Delhi go so well together. And the Bhaturas have the requisite amount of khamiri softness and taste. Extremely economical and second helping of chole too is ungrudgingly given. However, they are extremely spicy and so beware. If you want to reduce the calorie footprint have these chole with kulchas instead of bhature. But I doubt that anyone could restrain when the hot bhaturas are flying off the karahi in front of your eyes.